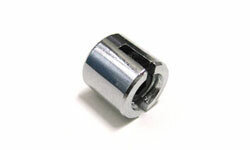 Used on cable kits to hold timber shelves or frames. 4 required for each shelf. This component allows a wood screw to pass through to attach to a timber shelf or frame. Once secured to the shelf/frame, then attach to the cable.